The "Export frame" option should give us an option to export a frame with Alpah or without Alpha. 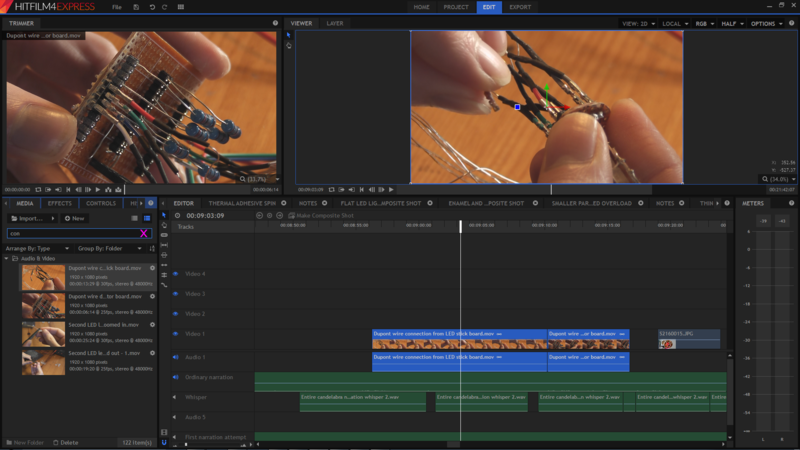 Right now the frames are always exported with alpha. Not so good if you just want a frame to view. Not all apps display pure transparency the same as Hitfilm (aka black). It would be better if Hitfilm could optimise use of screen space. A suboptimal use is highlighted in this screenshot; notice the unused space either side of the sliders whilst the numerical values are pushed off the screen (unecessarily). Please prevent selecting layers that are set to invisible in the composition view/window. I would love to be able to filter settings that are not the default values. If there is a clip that has had a lot of effects dragged onto it and their values changed, it can be a lot of node expansion to see what values were updated. Should be a way to display only the values that have been updated from defaults. @Deweak explore the new search filters in the controls and layers panels... That takes care of a lot of scrolling. Let's say you're working with a huge particle sim layer with multiple emitters, systems and mobile emitters... Type "Speed" into the search bar in the controls panel, and all you'll see is speed and speed variation values for all those particle systems without anything else... It's great in the layers panel as well. Say all these different emitters are connected to different animated point rigs. In the Layers search bar type "Point" and all other layers will hide, leaving just the point layers there to adjust. Once you get used to this new tool, I think it will be one of your favorite features. 8K is an insane amount of resolution for motion pictures right now... but it's a nice option -- I'm suspecting that it's going to please a lot of matte painting artists. In the bellow screenshot, Hitfilm rejects the value (returning it to whatever it was before the attempted change) whereas experience tells me most other programs would accept it. Also, I'd like it if Hitfilm remembered the last used keyframe type and used that for each new keyframe until a different type was selected. Also it would be cool if you could click on a layer in the compositor preview window and press a button or key to jump to the layer in the layer window/area. Along with referencing compositions in 3D object texture slots, a plugin like RE:Vision Effect's RE:Map would be quite useful. It would also be useful for imported 3D rendered content. I would like cut and paste in the composite shot editor layers box to work the way it's expected. Currently it pastes always to the top of th list of layers instead of between the layers the cursor is at when selecting paste. The current situation make it time consuming to move layers around and also confusing until you realise the layers are being pasted at the top of the list. Thanks for implementing easier L/J cuts in some form. That said, your implementation requires two mouse click+drag operations to complete the function. I will again propose that a modifier, like Alt, be added to the Roll edit tool for a single mouse click+drag solution. In sound fx libraries we often get multiple variations of a SFX in the same file with silence in between. show the playhead position with a vertical line across the waveform. This should be fine since the full length audio waveform is shown in the Hitfilm viewer. If you want to get "fancy" there are other things but let's start here. Obligatory Vegas screenshot (trimmer) showing what I mean by a selection highlight. 1. Be able to load image sequences into 3D objects texture slots. 2. Load lights and cameras (including animations) with the FBX import. 3. Option to link the Echo Audio effect (and other echo type audio effects) amount to a 3D layer. Could be a nice companion to the Doppler effect. The export queue is awesome! It has saved me a lot of time. Thank you! 2. Add a checkbox next to each export to enable\disable the export. Along with options to enable\disable selected exports. 2. 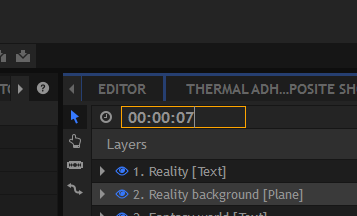 Add a 'Set To Selection' option that sets the in\out of the timeline to the start\end of the current selected layer(s). 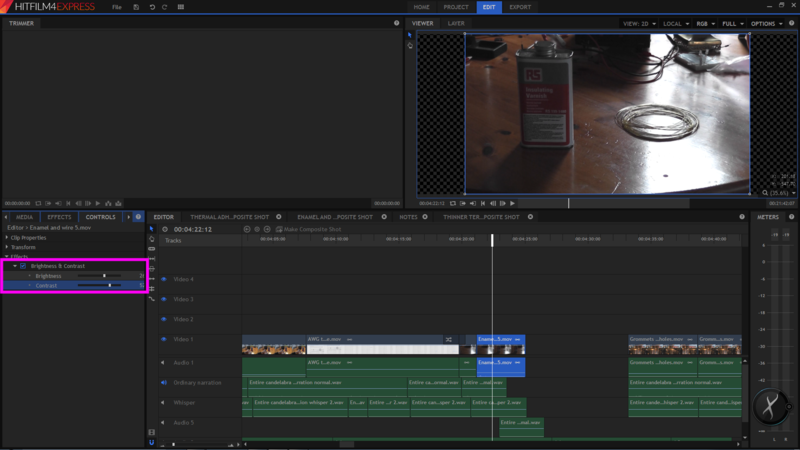 One thing I'd like to add to the editor is a way to select everything to right of the cursor or everything to the left... it's surprisingly useful for moving around large collections of clips to make room in the timeline to move others around. In 2017 you have added the ability to search and limit the display of controls in the composite timeline. The wishlist has had requests for a feature to show only comp timeline controls that have a keyframes enabled. Working with the 2017 implementation I suggest the following. Use a special character to signify limiting to controls with keyframes enabled. Something like @. Something never used in labels. So @ all by itself in the search would limit the display to controls with keyframes enabled. That fulfills existing feature requests. Now with your text search feature of 2017 things get very interesting. Something like "@Position" or "@ Position" could limit the timeline display to controls named Position AND have keyframing enabled. There is a boundary condition. What if the user enable/disables a control for keyframing in the controls panel. An easy thing that is probably okay is to just clear the timeline search field if it has the special char. One can be slick and detect if the control matches the timeline search criteria and re-execute the timeline controls list fill. You probably already have a procedure to check for a given control. Of course just having a button that limits the timeline to keyframe enabled controls only is always an option. Just trying to work with the UI you have just implemented and keep requesting keyframe only display ability. HitFilm really needs render farm capability. After Effects has this, although it's a somewhat clumsy affair. I used to work with a program called Combustion which had a rather elegant render farm utility called Backburner which made setting up and running a render farm a relatively straightforward process for it's up to 10,000 allowable nodes. Hitfilm could benefit very much from a similar utility and capability, even if it's for a smaller number of nodes. Currently in Hitfilm (3?/4/2017) when you double click a control label in the controls panel, it selects the control in the composite timeline. It also expands the comp timeline hierarchy as necessary for the selection. Is it possible to add flaming ember effects? Option on each light to only affect certain objects in scene. Ultimately this would be taken care of by expressions and being able to reference other layers (in different comps) and their properties at a specified time (or offset). In the meantime, expanding the layer parent feature to follow user selected channels (in different comps also) and modulated by a curve with a definable time offset would be really helpful for motion graphics. By going into File>Options>Keyboard Shortcuts you can remap most shortcuts. The space bar is already supposed to be Play/Pause.